Doors 8:30 for setup - 9:00 sign-in. Want to see the gallery of photos from our Tea Party and Officers Installation? Just click here. . .
Thirteen members showed large, small, and everything in between quilts. As usual we enjoyed viewing these beautiful and fun quilts. See the quilts displayed at this link. . . Still interested in A Quilter's Lumberyard ? information and pictures here. . . Friendship Groups are such an important and fun part of our guild. ​If you are an active member of Chino Valley Quilters and would like to join a group, please contact a Board member or a Chairperson. This month, Genny Applebee presented to the membership at the general meeting the labels she had made via her inkjet printer using freezer paper on the back side of your fabric, ​here for more. . .
We just added another exciting resource. If you have not already visited the AQSBlog website, take a look. This website offers free patterns, free block patterns, show information, quilt kits, and so much more. You can find it under Resources, Publications & Links page for just click here. . .
Members, if you have a tip or a trick to share, please contact Marci Meyer or Judy Van Haecke. They will be able to add your idea to the website. ​Click here. . . and here. . . Patsy Franco announced that Patty Pierce, of Phoenix area, will talk about how to work with and use old linens. She is infatuated with any older linens such as tablecloths and dish towels from around the 1930's-1960's. Patty scours flea markets, estate sales, antique shops and etc. to find beautiful and fun vintage linens. 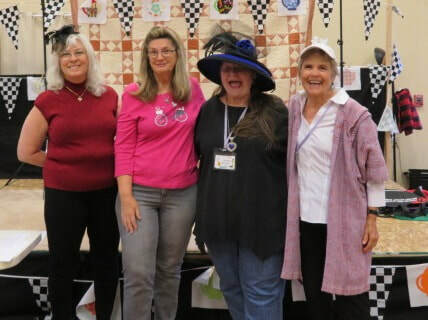 Patty was one of the featured speakers at the Arizona Hall of Fame 2019 quilt show in March. She will conduct a workshop at the conclusion of our meeting. The cost of the workshop is $35.00 and includes patterns and lunch. Our Chairperson, Lucille Hurley, announced that the challenge is a "Mystery Challenge." No one will be working on the same design because members will be creating their own from a set of elements determined by a questionnaire previously filled out by all members. See complete information on the challenge ​here. . . If you have a birthday and it is not shown, please let us know. *Reminder: When your birthday falls within our meeting month, please remember to bring a gift with a value of approximately $10.00. A suggestion would be to think of something small that you would enjoy for yourself. If you could not attend your birthday month's meeting please bring your gift another month. Dolores Dickerson announced that this month's winners were Brenda Burchill and Judy Van Haecke. ​No Name that Block next month - Tea Party & Installation. Joanne has started the Chino Valley Quilters' Library. She asked members to bring in any books, DVDs, and magazines they no longer wish to store and they will become part of the library for members to check out and return. Please remember to bring your books and etc. to each meeting. April BOM: "Card Trick." Use cream and 4 other colors in the same color family. Each month members are asked to make three of the current month's block; two go to the Comfort Quilt program and one of each submitted will be collected for a member to win when their name is drawn by Liz. The more blocks submitted, the more members can win. This month's winner was Lynn Vega! ​The winner this month was Dian Grayson; congratulations! No 50/50 next month - Tea Party time! Dolores announced that next month there will not be a drawing since it is the Tea Party & Installation meeting. ​However, she did say May would be Spring Flowers for fat quarter drawing.